An indigestible carbohydrate found in fruits, vegetables, whole grains and beans, fiber adds bulk to stools, speeds the movement of food through the digestive tract and promotes regularly. This can aid in the treatment and prevention of constipation. The significant amount of fiber found in some types of pumpkin -- including canned, unsalted pumpkin puree -- makes it a healthy choice if you want to avoid or manage constipation. Constipation is a condition in which you have fewer than three bowel movements per week or have bowel movements that are small, dry, hard and painful. The condition affects up to 15 percent of the U.S. population. Though a number of issues can cause constipation, diets low in fiber are often to blame. According to the Academy of Nutrition and Dietetics, adult women and men should get at least 25 and 38 grams of fiber each day, respectively, to prevent constipation and maintain good health. Depending on the type of pumpkin that you choose, fiber contents may vary. 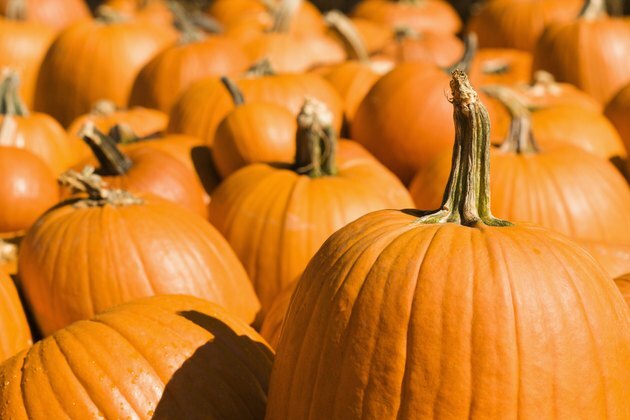 One cup of canned, unsalted pumpkin has about 7 grams of dietary fiber. Similarly, 1 ounce of roasted, unsalted pumpkin seeds contains 5 grams of fiber. Boiled, raw pumpkin also provides some fiber, though in lesser amounts -- around 3 grams per cup. When you add pumpkin to your diet, remember that not all products are created equal. Canned, unsalted pumpkin puree provides 83 calories and 20 grams of carbohydrate in a 1-cup serving -- making it an especially healthy choice. Compare this to commercially prepared pumpkin pie filling, which contains 281 calories and 71 grams of carbohydrate in a 1-cup serving. The increased calorie and carbohydrate content found in pumpkin pie filling is likely due to the sugar added to most canned pumpkin pie mixes. You can incorporate pumpkin into a healthy diet in a number of ways. Stir a spoonful of canned, unsalted pumpkin into soup for extra flavor and a nutritional boost. Bake fresh pumpkin or add it to ground beef, vegetables and spices for an easy fall casserole. Add canned pumpkin to oatmeal, cereal or fresh fruit for a nutritionally sound breakfast that packs a flavor punch.